The reason, as you can see by the figure below (click for a larger image) is that the bullet rises quite a lot. 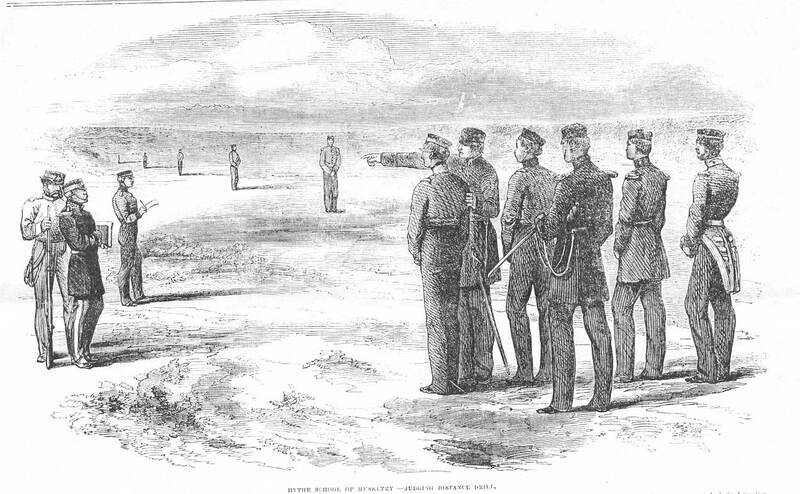 Here a kneeling rifleman fires at a standing attacker with his sight set to 300 yards. The center line of the rifle barrel is 40″ above the ground, so at midrange (about 150 yards) the bullet will rise to over 83″, well over a soldier’s head. Thus the dangerous space extends about 75′ from the muzzle, after which the bullet will go over an enemy’s head. As it descends there is another dangerous space starting at about 240 yards, where the bullet gets down to 64″ (head height), and continues for another 110 yards, ending when it hits the ground. This shows graphically why commanders so often told their men to “fire low!”—and why the trees were so often shot up. I’ve seen examples of volleys fired at enemy formations that missed completely, most likely because it went over their heads. Thus the tendency, at least for the line of battle, was to wait until the enemy was close enough so that you couldn’t miss. This concept figured into combat formations as well. A column was extremely vulnerable to rifle fire because even a rifle aimed with a poor distance estimation would probably hit somewhere along it. On the other hand, to hit a two-deep line formation, which most units used, your range estimation would have to be pretty spot-on or your volley would go over or under. In practice the training was conducted like this example from the British Army in the 1850s. Men were placed at varying ranges and the rifleman required to estimate the distance. This was repeated until they were at least reasonably competent, and special attention was given to officers and NCOs, who were expected to issue commands to set sights at certain ranges. During this period the British Army had probably the most advanced marksmanship program in the world. Like today’s Marines, every soldier was expected to be a rifleman and master at least the basics. The entire army—not just special units—was armed with rifles, and all rifles had sights that could be set to long ranges. So how did the soldier translate this into practical use on the battlefield? Most infantry rifles were equipped with ladder sights like the Enfield one pictured below. For normal use the ladder sight lay down in between the “ears” of the battle sight. For quick adjustments, the slider could quickly be moved up the notches on the battlesight to 100, 200, 300, and 400 yards. For longer shots the ladder would be flipped up as shown and the slider moved to the appropriate range number. 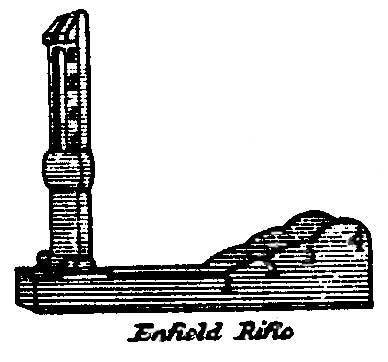 For the Enfield the maximum setting would be, depending on the model, 900 to 1100 yards. What remains a live question, however, is just how often soldiers and units utilized these capabilities and actually fired at longer ranges. British military historian and lecturer Paddy Griffith looked at this question in his 1987 book Battle Tactics of the Civil War and concluded that in spite of the increased range of the weapons, the engagement ranges had changed little since the Napoleonic wars. Earl Hess, whose books on fortifications are considered the definitive works on the subject, has taken up the topic as well and will be coming out with a book on the effect of the rifle-musket this fall. From conversations with him, it seems that he agrees with Griffith and I would say that this is fast becoming the conventional wisdom. In the coming weeks I hope to take up the subject as well, and will of course be taking a look at Hess’s book when it comes out. I’ll be interested to hear what you have to say about Hess’s book. I’m definitely looking forward to it and I hope to pick up a copy as well as soon as it’s out this fall.